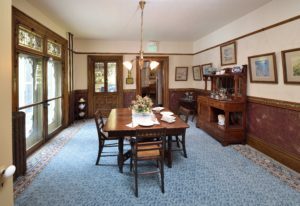 The Frances Willard House Museum is available for use by groups and organizations for meetings, events and other gatherings. These may or may not include tours of the house or other museum-related programming. Our event space comfortably holds 30-40 people. There is a small kitchen for food preparation on site, but no refrigeration or oven. No alcoholic beverages may be served and fresh flowers are not allowed. The museum is also available as a film and photography site. Please email info@franceswillardhouse.org for more information, and our usage policy, fees and agreement.